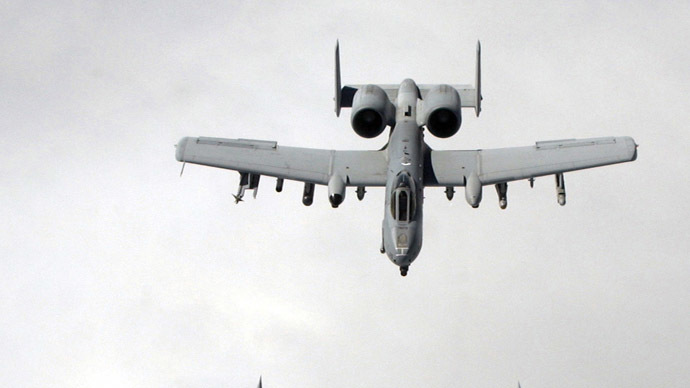 Four US A-10 Thunderbolt II attack planes are taking part in war games in Poland, as the nation expects about 10,000 NATO forces at drills this year. Moscow says the military build-up at Russia’s borders will have a negative long-term impact. The A-10 aircraft are based in western Poland, at an airbase in Powidz, where they will be involved in a series of training missions until Friday, Polish army spokesman Artur Golawski said, as cited by Reuters. The planes – designed to attack tanks, armored vehicles and other ground targets – arrived at the 33rd Powidz Transport Air Base on Tuesday, according to The Aviationist. They followed two C-130 Hercules military transport aircraft. On Wednesday, Polish Defense Minister Tomasz Siemoniak (who is also deputy prime minister) said that he approved of the constant presence of NATO troops in his country. “We are striving for it and we are talking about it. We are preparing ground for the constant presence,” TASS quoted him as saying. Around 10,000 allied forces are expected to take part in this year's drills. The military exercises are supposed to come as a part of Operation Atlantic Resolve, which aims at “reassuring NATO allies and partners of America's dedication to enduring peace and stability in the region” following the recent developments in Ukraine. In the Czech Republic, where anti-war activists launched the 'Tanks? No thanks!' campaign in order to protest against what they called a “provocative victory parade” near the Russian border, people were instructed not to throw tomatoes or eggs at a US military convoy, as they could face charges of up to three years behind bars. Dragoon Ride demonstrated its weapons and military equipment, including Stryker armored fighting vehicles and Humvee military automobiles, in Lithuania, making stops in six cities. It continued its procession in Poland, where it was accompanied by military gendarmerie and military helicopters. This week, the air forces of Finland and the US have started joint military exercises, later to be joined by Sweden, TASS reported. The drills are mainly taking place in the skies above the sea, not far from the western coast of Finland, and will also occur in international airspace. At the beginning of March, six NATO warships participated in naval drills in the Black Sea. The operation, headed by the US, included anti-air and anti-submarine exercises. The 3.5 month series of joint exercises commenced in Bulgaria. About 350 US army officers, as well as US tanks, helicopters and armored personnel carriers, came for the drills. The US also delivered over 120 armored units, including tanks, to Latvia this month. The country’s defense minister, Raymond Vejonis, welcomed the move, saying on Twitter that “the presence of our allies (US and NATO) in Latvia is a confirmation of solidarity and security in the region." Last month, the US deployed twelve A-10s in Germany, and in January NATO stationed additional troops in the three Baltic states – Romania, Bulgaria and Poland – as part of its new strategy. Poland is one of the closest US allies in Europe, in addition to being one of the leading heralds of the so-called “Russian threat” in eastern Ukraine. The crisis there broke out last spring after Kiev sent its military to the Donbass region to suppress dissent against an armed coup in the capital. The internal conflict has already claimed over 6,000 lives, according to UN estimates. “NATO is developing its rapid response forces and is boosting its infrastructure near our borders, we are registering attempts to violate nuclear parity and the creation of the European and Asia-Pacific segments of the missile defense systems is being sped up,” Russian President Vladimir Putin said in an address to the FSB collegium on Thursday. Meanwhile, Foreign Ministry spokesman Aleksandr Lukashevich reminded that Russia has all the means to counteract nuclear threats. He said at a regular media briefing that “it’s high time the US renounced destructive unilateral moves in the sphere of missile defense, then there would be no need to worry about their consequences,” TASS reported. “Today’s problem is not Russia’s military activity, but the increased military activity of NATO. Every other day new military exercises take place within the framework of The Readiness Action Plan of the alliance. The number of NATO drills has exceeded 200. The total number of tactical flights of the NATO air forces over the Baltic and Barents Seas, as well as bordering Russia regions last year exceeded 3,000, which is the double number of 2013 drills,” Grushko said, adding that the figures estimating Russian military activities in 2013-2014, along with current activity, have mostly remained at the same level. The Pentagon acknowledged that over 1,000 American troops based in Europe have recently been moving across Eastern Europe to participate in the military exercises. The operation is set to "demonstrate the freedom of movement that exists within NATO,” according to military spokesman Steven Warren. Another point of Russia’s concern is the possibility of US weapons deliveries to Ukraine. The conflict-torn country is already facing large-scale international drills instructed by the US this April, which are set to last until November. President Poroshenko said they mean “integration to the biggest defense structure in the world,” Interfax reported. “Weapons supply activities from the US to Ukraine are fraught with a failure of a shaky truce in Donbass and outright threaten Russia’s security,” the Russian Foreign Ministry spokesman said, pointing out that it undermines the Minsk agreements and calls into question the plans of the US, as well as NATO.